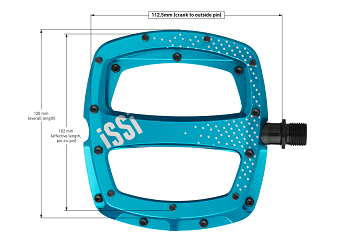 Don’t your flat pedals deserve some TLC? So how do you know when you should replace your flat pedal pins? Well the first indicator for most cyclists is that your pedals just feel wrong. If you find your feet slipping or resting funny during the ride, it’s probably time to check the pins. Damaged pins can lose length, sharpness and integrity, which makes them feel unstable. But the most obvious tell is if any of your pins are missing. This can be caused by extensive vibration or a precisely aimed pedal strike. And while a missing pin is easy to spot, a closer look is required to make sure that the threads inside of the pin cavity are still in good condition. Otherwise you may have trouble screwing in the new ones. Use a magnifying glass and good light to carefully inspect each hole for damage or debris. Speaking of debris, it’s important to make sure your pedal is well cleaned so that you can see any bonus damage that may be below the dust. We recommend using a damp sponge or paper towel to scrub each pedal by hand and then using a rag or compressed air canister to dry and remove any leftovers from the nooks and crannies. Look carefully for any cracks or chips that could compromise your new pins or the pedals themselves. After removing the grime, check each pin to see which ones need to be replaced. Look for gashes, dents, chips or any kind of damage that may reduce the pins’ effectiveness. Once your pedals are clean and the pins are inspected, it’s time to actually remove them. 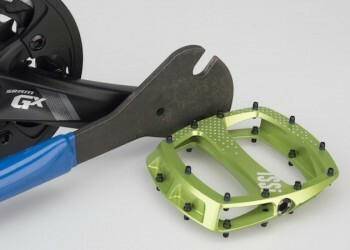 Different designs may require different tools, but most will use either a socket wrench or a small hex key. For example, our iSSi Stomp Replacement Pins work with a 2 mm hex key (included) or a 5 mm wrench. If your pins are too damaged to remove with those tools, some good ol’ fashioned pliers can also do the trick. Simply turn each pin counter-clockwise from the base to unscrew and remove. If your pins are seriously stuck, we advise that you visit your local bike shop for professional help. Make sure that each pin is inserted in the right direction. This creates a concave shape that fits your foot. Now you can enjoy your next ride knowing that your flat pedals are hanging on tight. For more tips and helpful “How-Tos” be sure to check back here soon!